A Dollop Of Me | family, food, healthy living, life's tidbits: Babies Embroidery! Since becoming a mother, I have made friends with many other young mothers in a very short span of time. There's nothing like sharing a life-changing experience that bonds people - and motherhood certainly is one of those experiences. I now have many little ones to shop for as well. 1st month celebrations and birthday parties seem to take up more space on my calendar. 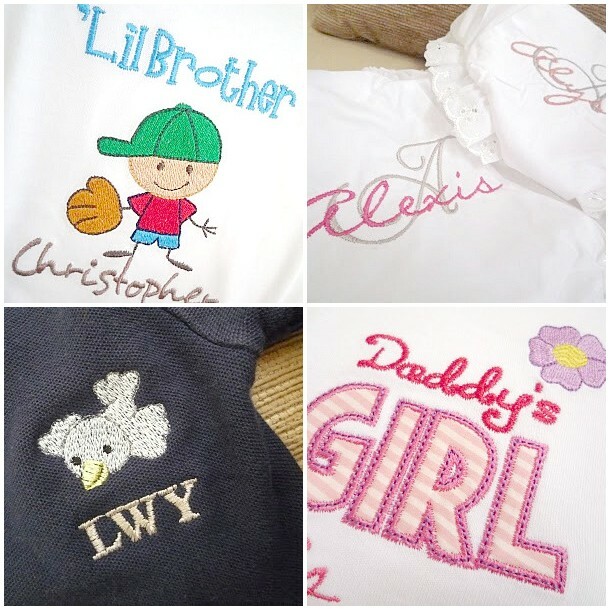 With hardly any time for shopping, I love to buy customised gifts from Babies Embroidery. The nice lady who personally does the designing and sewing started doing this for friends and family. I was one of the lucky recipients of her handiwork. Her site is still very much in the works, and even the name of her shop is a temporary one - but for me, it doesn't matter because the stuff she churns out never fail to charm! You can browse from the many designs she has done to choose what you want. Or, if you are like me - drop her an Email with a brief description of what you would like, and who it is for, and let her do the rest. I love it that she is able to do embroidered designs from scratch. If the kiddos I am gifting to know each other, I would choose different clothing items - T-shirt styles, Onesies, Bloomers etc so that they each truly have one-of-a-kind piece.